Whom Should College Students Really Call When They Are Sexually Assaulted on Campus? At a Senate hearing, Kirsten Gillibrand says that “survivors have lost trust in law enforcement”—but can they trust their colleges either? Lawmakers took up one of the most vexing questions about campus sexual assaults on Tuesday: who is best suited to handle complaints and investigations—college administrators, or law enforcement? The juxtaposition of two separate processes for handling allegations of sexual assault has grown into a “complicated thicket” that discourages survivors from reporting, Missouri Senator Claire McCaskill said in testimony before a subcommittee on crime and terrorism. “When you combine those two systems, it is confusing and complicated,” she said. For example, universities and law enforcement use different burdens of proof, and they’re trying to achieve different things: colleges must meet their obligations under Title IX to maintain a safe campus for all students, while the criminal-justice system enforces the law. While the two systems aren’t functioning well together, neither serves survivors (or, arguably, the accused) well on their own, either. As Michelle Goldberg laid out in her June cover story, almost no one is satisfied with current campus adjudication processes. Some critics contend that dealing with complaints internally “trivializes a serious felony;” others worry that administrators are more concerned with their institutions’ reputation than with justice; finally, there are concerns that disciplinary boards do not adequately protect the accused’s right to due process. On the other hand is the criminal-justice system, which some see as the solution to flawed internal systems for dealing with complaints. Sheldon Whitehouse, who chaired Tuesday’s hearing, said he was “concerned that law enforcement is being marginalized when it comes to the crime of campus sexual assault,” and that “victims will pay the price” if crimes aren’t reported to local police. The fact that most campus rapists are serial offenders is one reason why internal sanctions are insufficient. Even if a perpetrator is expelled, he may still pose a threat to women outside the university. A thicket, indeed. The way out—or at least the one pointed to in Tuesday’s hearing—may pass through Ashland, a small town in southern Oregon. The Ashland Police Department and Southern Oregon University have transformed the way they handle sexual-assault reports, and the result is a dramatic increase in reporting, as well as a doubling of the number of students who choose to involve law enforcement in their cases. Now, more than three-quarters of the cases that come through the university’s confidential advising program ultimately involve law enforcement. One defining feature of the police department’s You Have Options program is that it gives survivors more control over the process. They can choose to report anonymously until deciding to proceed with a criminal investigation; once that’s underway, they can ask for it to be put on hold at any time. “A lot of survivors feel catapulted by the process” of a criminal investigation, testified Andrea Fleischer, who was involved in the creation of You Have Options and a companion program at SOU called Campus Choice. Allowing survivors to suspend or pause the investigation gives them time to manage the rest of their lives—final exams, for example—without dropping out of the process completely. The other critical piece of the Ashland programs is that cops and university employees who work on sexual-assault cases receive special training in interviewing trauma victims. For a variety of reasons, trauma survivors may have trouble recalling or be reluctant to share certain details. Those inconsistencies or gaps might seem like lies to an inexperienced officer. But a trained interviewer, Fleischer explained, would start with open-ended questions like “tell me what you remember” about a certain event, rather than demanding that a victim lay out a strict chronological timeline. Fleischer said such “trauma-informed” training is “the most important first step any campus or law enforcement agency can take” to develop a better response system. Two other witnesses who testified on Tuesday also pointed to Ashland as a model for best practices that should be adopted across the country. However, what makes Ashland so exceptional is the police department and the university’s commitment to reform and cooperate in a manner that requires a high level of training and resources. The appetite for undertaking such a transformation in sexual-assault procedures doubtless varies widely across campuses and law-enforcement agencies. 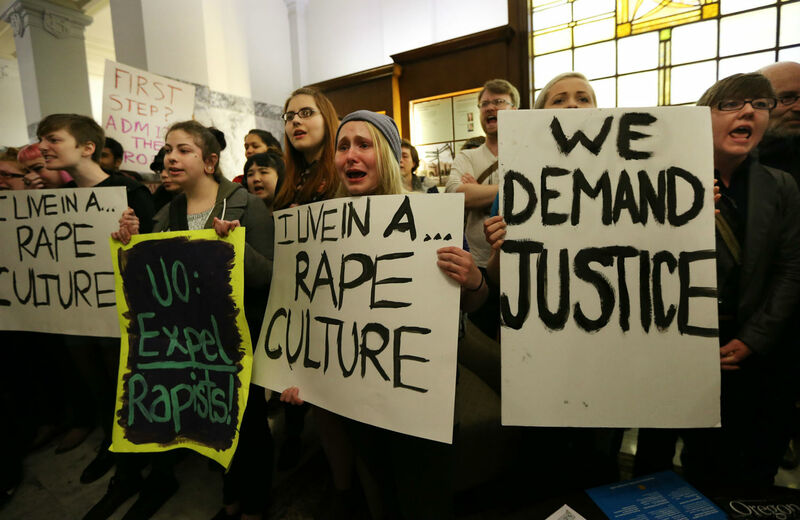 The reform bill put forward this year by McCaskill and Gillibrand, among others, focuses on how universities respond to reports of sexual assault; it doesn’t offer much in the way of changing the way police departments treat survivors. The measure (called the Campus Accountability and Safety Act, or CASA) would force colleges to be more transparent about sexual assault and to designate “confidential advisers” to help students navigate the reporting process on campus and in the criminal-justice system. It would also levy financial penalties for Title IX and Clery Act violations, but it provides no funding for the understaffed offices that oversee enforcement, meaning that punishment might never be more than a threat for most delinquent institutions. CASA attempts to bridge the gap between the campus and the criminal-justice system by requiring schools to establish a Memorandum of Understanding with law enforcement regarding information sharing. But as Cornell University Police Chief Kathy Zoner testified “if we can reach an MOU, there is no guarantee that local law enforcement will cooperate, nor are there consequences if they do not.” Certainly the campus process needs reforming. But unless lawmakers ask more of police departments, too, it will be half a solution.